Composer, educator. Building Sound Collectives. Working for cultural sustainability. Siloé is a neighborhood in Cali, Colombia with a long history and a lot of culture. It is also considered “Cali’s most dangerous barrio“. Through the friend of a friend, yesterday, I heard about Colombian musician and composer Moíses Zamora Mesu, who is working in a project called Los tambores de Siloé. Today, Moíses invited me to come and visit. 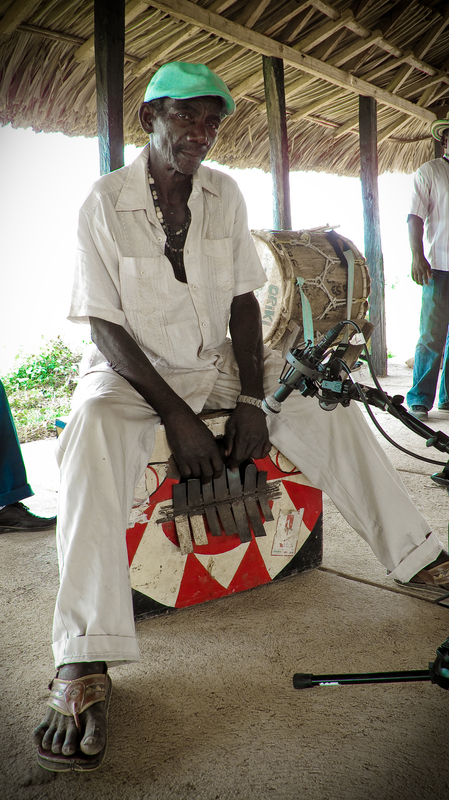 Every Tuesday and Friday, Moíses teaches music to a group of young kids in Siloé, playing on homemade instruments. With a lot of patience and innate teaching skills, he teaches the children to play his own compositions inspired by Colombian folklore, reggaeton and rap music. Notice the homemade instruments. So we have the “marimbotella”. This is a small marimba, where the bars are made from chonta wood – which is traditionally used in the marimbas of the Pacific Coast of Colombia – and the resonance tubes are made from … plastic bottles. A combination of garbage and traditional local materials. And we have the Bernáfono”, an instrument made from PVC tubes. The inventor of the instrument is Héctor Tascón. He is also the one who initiated the project, some years back. His wife is called Berna, by the way (guess where the name of the Bernáfono comes from 😉 ). As opposed to the marimbotella, the Bernáfono doesn’t correspond to any existing instrument. It is rather – as Moíses explained to me, After the class, over a glass of ice coffee – a kind of bass marimba, using the principles of a pan flute. Moíses and I talked about the use of recycled materials, and the perception of value. He told me that an aunt of one the girls in the group had asked her – in a condescending tone – what kind of trash this weird collection of tubes was supposed to be. The girl had explained to the sceptical aunt, that she considered herself proud to be a “bernafonista”, that it was not at all trash, and that it made her able to create beautiful music. Moíses told me about a boy, who since a young age had participated in the project. Now, at 15, he’s an accomplished marimbero, and Moíses hires him to play with him at gigs at weddings and the like. It’s kind of a cliché that a career as a professional musician can be “a way out of the ghetto” for young people. Nonetheless, as i experience it, the project Tambores de Siloé seems to be successful in opening up other alternatives, other worlds, for young people in a neighborhood characterized by huge inequality. Fotografia > carlos andres vallejo. Inspired by a comment by Sergio Valdez, I would like to share some thoughts about being an independent researcher. It’s a huge challenge to be an independent researcher. One thing is the obvious lack of time (a problem, I deal with here), since we need to work in something else to earn a living. Another thing is the lack of access – to networks, to libraries, to journals, to recognition. However, being an independent researcher also means independence from a highly politicized, competitive environment. In mainstream higher education institutions you have to deal with all sorts of more or less bizarre things, that are putting restrictions to your possibilities to do what you’re supposed to. What I hear from my ‘dependent’ conspecifics is that they are subject to managerial pressure towards a more commercial bottom line kind of approach. At the same time, they are experiencing financial cuts, which puts pressure on their work environment, having to spend more and more time with administrative tasks, and dealing with an increasing number of students. The trend is towards a more top down approach, where research institutions have to live up to more and more detailed policy demands in order to get the financial support from policy makers. As an example, within the field of Pedagogy, there is the so-called ‘early childhood preventive intervention’ (in Danish: tidlig indsats). This kind of policy induced trend in research has a double edge. On the one hand there is no doubt, that a lot of children need the kind of help, the program is aiming at. On the other, it’s evident that the State has an interest in reducing welfare costs. However, it is crucial to ask what basic understanding of people and their possibilities to be agents in their own lives lies behind this trend. In other words: how can we avoid a patronizing bureaucratization of people’s lives? Being an independent researcher is an opportunity to realize projects that are disruptive to mainstream research policy agendas. It means an opportunity to be truly critical towards mainstream trends. What kind of thinking is possible in mainstream higher educational institutions? For one, as I have argued above, policy demands are putting rather clear limits to the content of research. Another thing is what kind of people are included. The environment of Higher Education is excluding a great number of people. For some, the demands to reading-writing skills is an obstacle, whether this is based on social or cognitive reasons. For others, the high level of stress and competition is an obstacle. And there are also those, who have a hard time coping with the intellectual/social/gendered environment of HE, for the reasons I have mentioned above. And then there are those who do not have the economical means to embark on a (precarious) academic career. In short, independent research is a place where we ‘misfits’ are thriving. In this sense, I am beginning to think of this environment as a place for empowerment and resistance, and I suggest we start talking about it in terms of ‘folk research’, ‘deviant research’, and why not give it a nickname: indiesearch?